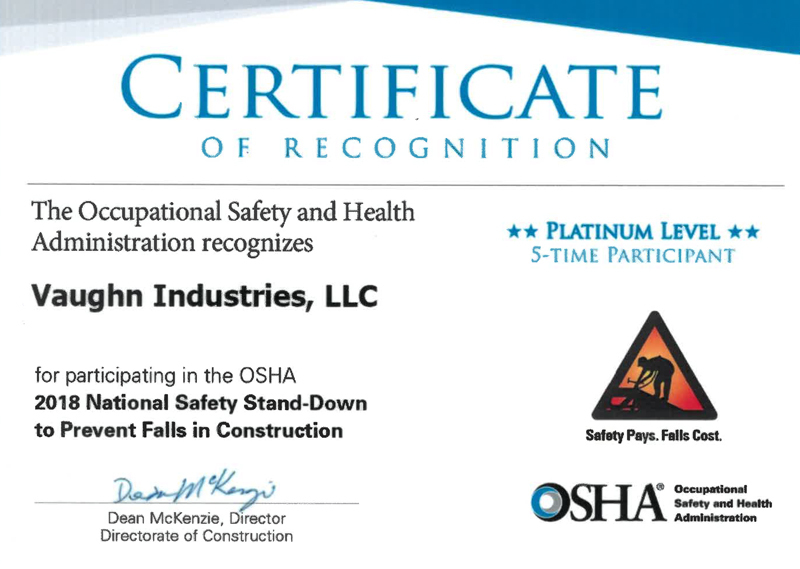 26 employees participated in OSHA's Safe & Sound week by holding a Safety Leadership Conference on 8/13/18-8/14/18 with Frontline and Utility Business Media, Inc. Frontline is a comprehensive training series of interactive and engaging classroom training designed to empower employees with the skills and knowledge to become utility safety leaders. Leading utility safety expert Mr. David McPeak facilitated the learning process and covered key areas of safety, including Safety Leadership, Incident Prevention and Human Performance. 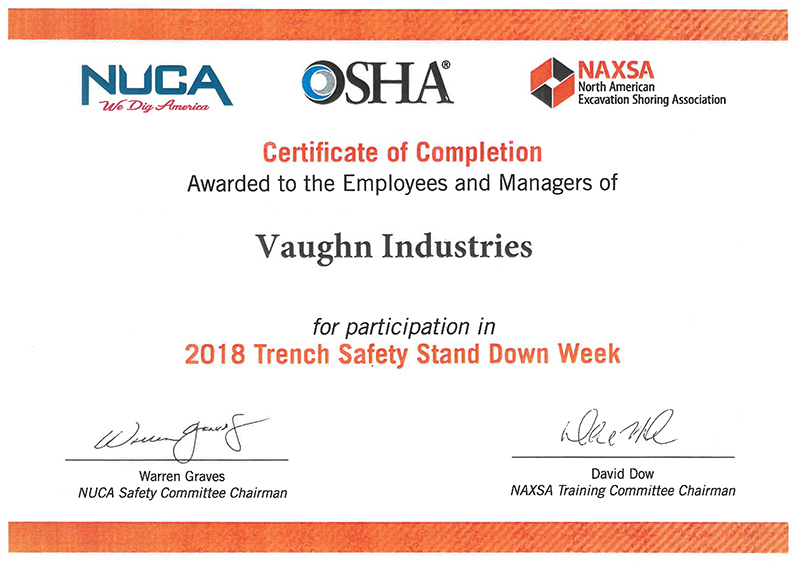 414 Vaughn Industries employees participated in NUCA’s Trench Safety Stand Down week by holding two Safety Tailgates . Our crews discussed different materials from NUCA as well as other information regarding the safety of working around trenches, from using trench boxes, shoring , and sloping appropriately, daily inspections of the trenches, ladder placement, and other topics. 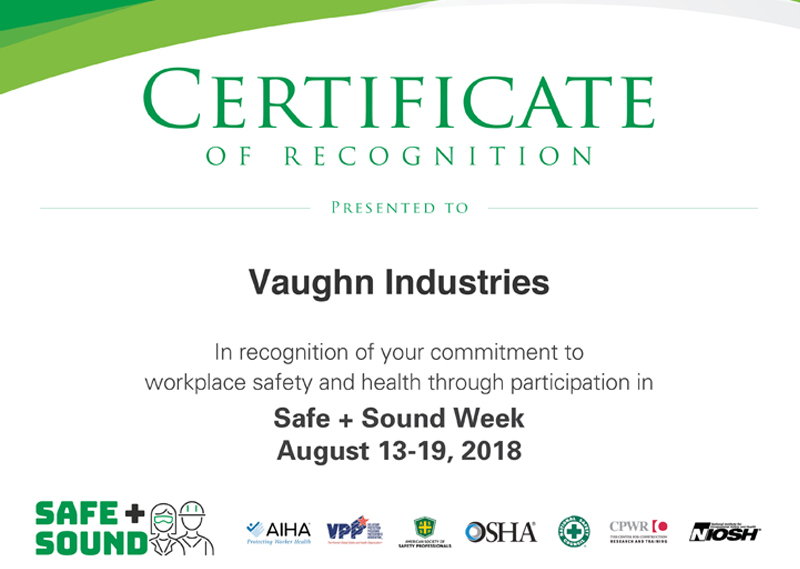 Vaughn Industries participated in the Fall Prevention Stand-Down by having a different hands-on Safety Tailgate each day that discussed different ways to prevent falls, including the inspection of equipment, proper use of ladders, emergency response to falls, and more.